This book explores the meanings and complexities of India’s experience of transition from colonial to the post-colonial period. 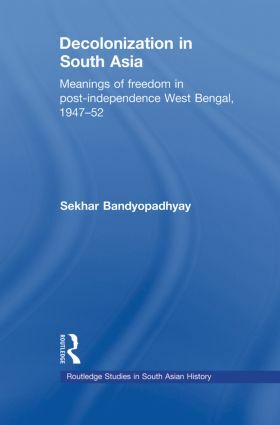 It focuses on the first five years – from independence on 15th August 1947 to the first general election in January 1952 – in the politics of West Bengal, the new Indian province that was created as a result of the Partition. The author, a specialist on the history of modern India, discusses what freedom actually meant to various individuals, communities and political parties, how they responded to it, how they extended its meaning and how in their anxiety to confront the realities of free India, they began to invent new enemies of their newly acquired freedom. By emphasising the representations of popular mentality rather than the institutional changes brought in by the process of decolonization, he draws attention to other concerns and anxieties that were related to the problems of coming to terms with the newly achieved freedom and the responsibility of devising independent rules of governance that would suit the historic needs of a pluralist nation. Decolonization in South Asia analyses the transitional politics of West Bengal in light of recent developments in postcolonial theory on nationalism, treating the ‘nation’ as a space for contestation, rather than a natural breeding ground for homogeneity in the complex political scenario of post-independence India. It will appeal to academics interested in political science, sociology, social anthropology and cultural and Asian studies.